Intraoperative liver ultrasound has a crucial role to guide open liver surgery. A 4-step ultrasound liver map technique for laparoscopic liver resection (LLR) has been standardized in our center. 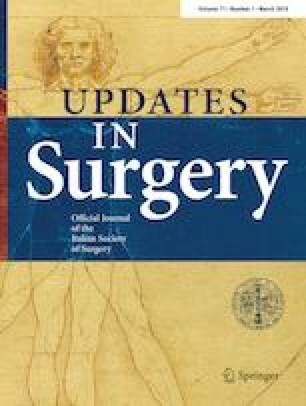 The aim of this study was to evaluate outcomes of our technique according to the hepatectomy technical complexity. A difficulty scale (DS) ranging from 1 to 10 was applied to each LLR. A cumulative sum control-chart analysis identified 3 periods of gradually increasing DS. Perioperative outcomes of the 3 periods were compared. 300 LLRs performed between 2006 and 2018 were analyzed. Median DS was 3 for first 100 cases (P1), 5 for cases 101–200 (P2) and 6 for cases 201–300 (P3). A significantly greater percentage of postero-superior segments resections (P1 11%, P2 36%, P3 46%, p < 0.001) were performed in P3. P3 LLRs had a significantly longer transection time (p < 0.001) and wider cut surface area (p < 0.001), but median blood losses were similar among the 3 periods (P1 100 cc, P2 100 cc, P3 140 cc). There were no differences among periods in overall morbidity (P1 12%, P2 17%, P3 17%), major morbidity (P1 1%, P2 2%, P3 3%) and length of hospital stay (5 days in all the three groups). Despite the increasing surgical complexity of LLR, ultrasound liver map technique allows good perioperative outcomes. The online version of this article ( https://doi.org/10.1007/s13304-019-00646-z) contains supplementary material, which is available to authorized users. We thank Denise Di Salvo, MS, from Edanz Group (www.edanzediting.com/ac) for editing a draft of this manuscript. Appropriate consent was obtained from all individual participant included in this study.